It’s a new calendar year in the NFL and Eric Reid is ready for what’s to come. 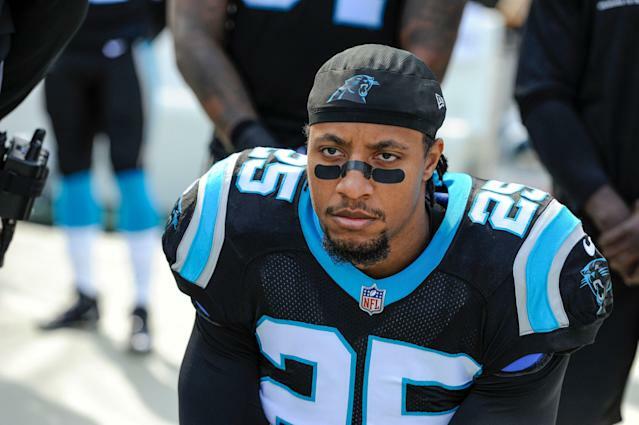 The Carolina Panthers safety threw a jab at the NFL for the “random” drug tests given to him last season by hinting at having already been tested, bulking up naturally at the gym and, of course, shouting out his trainer for it. Reid signed a one-year deal with the Panthers in late September and said he was tested seven times in 11 weeks. The odds of that happening, based on the rules set by the collective bargaining agreement, are 1 in 588. That’s a .17 percent chance. The note could be in reference to a recent drug test he was given. The NFL administers tests during the offseason, even while players are traveling internationally. Players must provide dates and locations of their whereabouts, provide evidence and comply with all test requests as they would otherwise, per the NFL policy. Marcel Louis-Jacques, the Panthers beat writer for the Charlotte Observer, noted in a quote-tweet players can be given up to six tests per offseason. It’s not clear if Reid, who signed a three-year deal with Carolina, was actually tested. He could simply be throwing shade at the league. One of Reid’s drug tests was procedural since players must take one upon being signed by a team. The next six are the ones under question. The drug-testing policy calls for 10 players from each team to be tested after each game per a computer algorithm that selects players randomly. With approximately 70 players on a team, and taking into account the limited time Reid was there, it’s incredibly unlikely a random algorithm chose Reid six times. Instead it’s thought he’s being targeted for his collusion case against the league and kneeling during the anthem. As Yahoo Sports’ Charles Robinson wrote in December, there is only one option for Reid if he wants to open the door on the “random” nature of the policy and that’s to sue the league. The selection process and policy was agreed to by the NFL and the player’s association, though that collective bargaining agreement is up after 2020. The NFLPA has not pushed for a closer evaluation of the testing procedures, including the algorithm used by the league, even though sources told Yahoo Sports players have previously complained. For now, it’s all suspicion and no hard proof on an issue that could become a key part of talks in the next agreement.